MEN aren’t usually concerned with the look, feel or smell of their hands and feet. 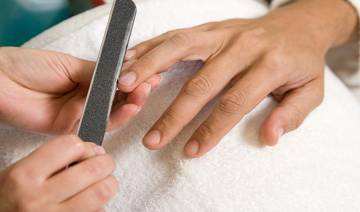 But since we are in flip-flop season and will be back again after winter, it’s important to file those ‘‘bear claws’’ and establish good grooming rituals to whip those nails into shape. Make sure to hydrate your hands every day with a moisturising lotion or just Vaseline. Using a men’s body lotion one or two times a day can restore moisture levels. Vaseline for men, Nivea and the likes will work fine. Washing your hands in hot water is great for killing germs, but terrible for the skin. Hot water can rob your skin of moisture and contribute to dry skin symptoms like redness and roughness. Opt for lukewarm or even cold water when washing hands. Protect hands from weather elements when outside for an extended time. It is important to always wear a sunblock with at least SPF 30 protection when in the sun, even the winter sun. This will reduce the risk of developing sun-relating skin damage from sunburn and sun spots. If it is cold outside, wear gloves. Wearing gloves also helps to protect the hands when doing lawn and gardening. I have met so many men who bite their nails and not only does it not look nice, you risk infection underneath your nail beds. So if you chew your nails as a nervous habit, train yourself not to do this. If you chew your nails as an alternative to cutting them with clippers/nail cutter, invest in a pair of good fingernail (and toenail) nail cutter. Change your socks daily. Feet get sweaty during the day, so it’s important to change your socks once or twice a day to prevent excessive perspiration. Some men develop hyperhidrosis (excessive sweating), a condition where the feet sweat so much they may slip around inside shoes. This condition can cause foot infections and foot odour. Wash your feet with soap and water. It is advisable for men to wash their feet with soap and water daily to control or prevent tinea pedis or athlete’s foot. This is a very common condition, especially for men who typically wear shoes that don’t breathe as well as women’s shoes do. Athlete’s foot is a scaly, itchy, and occasionally painful rash that spreads along the toes or the soles of the feet. The skin can occasionally blister and it is highly contagious. Thoroughly dry your feet. After washing your feet, it’s important to focus on drying the areas between the toes. You can apply lotion, but don’t put it between the toes because it can cause skin or tissue breakdown and ulceration. Cut toenails straight across. Sterilise your toenail clipper with a little rubbing alcohol and make a few small cuts. Don’t try to cut the whole nail at once and don’t dig at the corners of your toenails. Simply cut straight across, leaving the nails a little long. So men, please take care of your hands and feet. — Additional information from online sources.